Technology startups are finding it a tad easier to get funded with the many sources of funding and the fact that VCs are more active than before. We are also witnessing that the valuations are improving too. Apart from the usual non-traditional sources, friends & family, angels, angel networks, accelerators and seed funds, India is now witnessing the raise of crowd-funding platforms. Raising of pooled managed investment funds has always been a regulated area. SEBI in June 2014, released a consultation paper (“Paper”) which seeks to regulate crowd-funding, which is not pool managed, but the investor directly invests into the startup. The Paper defines (sort of) Crowdfunding as ‘solicitation of funds from multiple investors through a web-based platform or social networking site for a specific project, business venture or social cause.’ Perhaps, the traditional angel networks (which are not web-based) can breathe a bit easy? Well, it is yet to be seen. There are other legislations, including Companies Act 2013, which details lengthy procedures for raising investments. Read private placement and sweat equity. 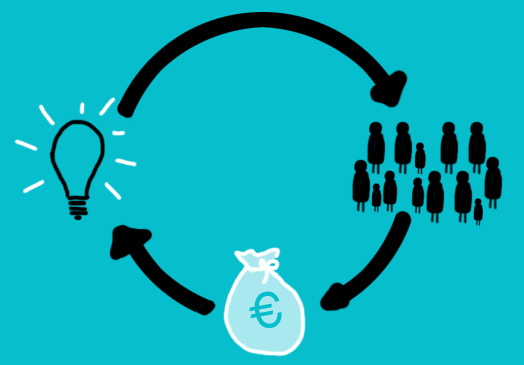 Who can set up a Crowdfunding Platform? We believe that the regulator should re-examine the intent to promote crowdfunding as not-for-profit activity. Qualified Institutional Buyers (QIBs) as defined in SEBI (Issue of Capital and Disclosure Requirements) regulations, 2009. Companies incorporated under the Companies Act, with a minimum net worth of Rs.20 crore. From a plain reading of the consultation paper, it appears that it is a self-certification method, with the burden of proof of accreditation imposed on the investor. Who can be the investee company and how much can it raise? A company which proposes to engage in non-financing ventures or real estate activities is not permitted. There are obligations expected of the investee company. In a given period of 12 months, the company shall not use multiple crowdfunding platforms to raise funds. Company shall not directly or indirectly advertise their offering to public in general or solicit investments from the public. Company shall compulsorily route all crowdfunding issues through a SEBI recognized Crowdfunding Platform. Company shall not directly or indirectly incentivize or compensate any person to promote its offering. The Company is also required to make certain disclosure through the “private placement offer letter” and on an ongoing basis documents such as audited financial statements, a detailed view of the current state of business, penalty, pending litigations etc. If the platform should not receive any compensation for helping the company raise investments, then sustaining the platform will be a challenge. The retail investors should be provided all opportunities to understand the inherent risks involved in investing in start-ups, illiquid nature of the securities and a possibility of losing the entire investment. At the same time, it is also important that there are no systemic risks. But, it is equally important the regulations proposed should enable platforms to operate and the start-ups getting invested. This entry was posted in Articles on February 3, 2015 by novojuris.